Ford CEO Alan Mulally, credited with reversing the automaker’s fortunes during his seven years at the helm, has emerged as the leading candidate to replace outgoing Microsoft (NSDQ:MSFT) CEO Steve Ballmer, AllThingsD reported last week. Microsoft would have a tough time finding a stronger executive than Mulally, whose work at Ford is going to be featured in business school case studies for generations. Ford racked up a $12.6 billion net loss in 2006, the year he joined as CEO. Four years later, it reported $6.6 billion in profit. But despite all that, several partners told CRN on Monday they don’t believe Mulally is the right choice to lead Microsoft out of its current doldrums. Andrew Brust, CEO of Microsoft analyst firm Blue Badge Insights, New York, believes Microsoft is facing a different set of challenges than the ones Mulally tackled at Ford, particularly as they relate to culture and strategy. “Mulally is not from the software technology world, and he’s not young, whereas Microsoft arguably needs someone with both of those qualities,” Brust said in an email. Given Microsoft’s intense focus on the consumer market, it’s unclear how Mulally’s background would help it compete more effectively with the likes of Google and Apple, partners told CRN. The 57-year-old danced to Michael Jackson’s Wanna Be Startin’ Somethin’, and declared that the company would “change the world again”. More than 13,000 Microsoft employees had queued to be a part of the annual company-wide event. The firm has not yet announced a replacement chief executive. 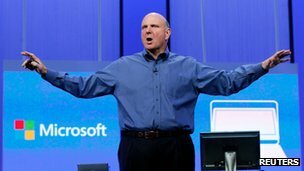 Mr Ballmer will retire within the next year and will leave the company in a strategically precarious position as it looks to claw back lost ground in the mobile sector. SEATTLE – The $731 million fine European regulators slapped on Microsoft Wednesday for failing to abide by an antitrust sanction reinforces the European Union’s longstanding insistence on fair competition. What’s more, the huge penalty also signaled that Europe won’t easily be swayed by Google and Facebook to back down from expanding online privacy rights for individuals, a policy that the U.S. tech and media companies contend would crimp the global growth of online advertising. Citing a technical error, Microsoft took full responsibility for failing to give European consumers a choice of Web browsers in shipping some 15 million copies of the Windows 7 operating system. The company had agreed to do that as part of a 2009 sanction closing out a protracted antitrust investigation conducted by the EU’s competition commission. That antitrust case began in 2004, and Microsoft paid fines of $357 million in 2006 and $1.3 billion in 2008 for being slow to comply with regulations. How does the Surface Pro measure up against other top tablets and laptop alternatives? By some standards, the Microsoft Surface Pro is the best-ever hybrid of tablet and laptop, combining a full windows 8 OS with an Intel Core i5 CPU, and a best-in-class detachable keyboard cover. But, at over $1,100 if you include a 128GB SSD and the keyboard, it’s also very expensive, especially if a slim Windows 8 touch-screen ultrabook, Atom-powered tablet, or something non-Windows-based would work for your needs. The following is a quick survey of the major alternatives to the Surface Pro, from other Core i5 tablets to Apple’s new 128GB iPad. The closest competitors to the Surface Pro are other tablets and hybrids with Intel Core i5 processors — essentially full-featured ultrabooks squeezed down to tablet form. Acer’s Iconia W700 fits the bill, and includes a space-age-looking dock, as does Samsung’s new Smart PC Pro 700T. Trading out the Core i5 for an Intel Atom processor gives you much-improved battery life (more than 10 hours in some cases), but also drops down the performance significantly. Prices for Atom tablets and hybrids are lower, but probably not low enough considering the difference between an Atom-powered system and one with a Core i5. Other current examples include theAcer W510, the Dell Latitude 10, and Lenovo ThinkPad Tablet 2. Prices generally run $500 to $800, with keyboards and docks included at the higher end of that range. It sounds like it’s time for Microsoft to finally start sharing more information, beginning with TV ads and a new official Surface blog, about its coming tablets and PCs. Windows Supersite Editor Paul Thurrott tweeted about the alleged timing of the ads, based on information from unnamed sources, on October 15. Thurrott also tweeted that he’s been told that Microsoft is spending $400 million on its Surface ad campaign — plus whatever it’s spending on its Windows 8 ad campaign. Microsoft kicked off its U.S. TV commercials for Windows 8 on October 14 in the U.S. While Crispin Porter + Bogusky is the ad agency behind the Windows 8 ads, they are not believed to be the ones behind the Surface campaign. Microsoft used a Seattle-based duo to create the initial promotional short film about the Surface. I asked Microsoft for comment and didn’t hear back. Update: I received a no comment from a spokesperson about anything and everything to do with any alleged Surface ads. Whatever happens on the ad front, it looks as if a new official Surface blog is set to launch soon. The Microsoft Surface Twitter account posted its first tweet this past weekend. The holidays are undoubtedly one of the most aggressive times of the year for game retailers, with multiple consoles competing for a place in your living room. This year is perhaps going to be one of the most aggressive, especially with the Nintendo Wii U hitting the market in November and rumors surrounding Microsoft and Sony’s next consoles circulating. Along with the anticipated holiday bundles, both Nintendo and Microsoft have announced price cuts for their respective consoles. While the Wii andXbox 360 are pushing 6 and 7 years respectively, the price cuts are an effort to ship more units of the ageing hardware. Any sort of a price reduction is welcome, but you’ll still notice a huge contrast in prices between the two systems.